Do you love kids and fitness? Were you a gymnast and want to share the joy of gymnastics by becoming an instructor? Do you have a schedule where you can commit at least 5 hours a week consistently? ​Never coached before? That's okay. PEG has a teacher training system that is open to individuals who want to learn the art of coaching. The training is free at our facility. 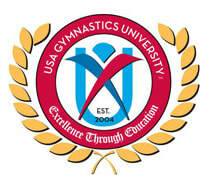 All PEG teachers are required to be a Certified USA Gymnastics Instructor within 60 days of employment.